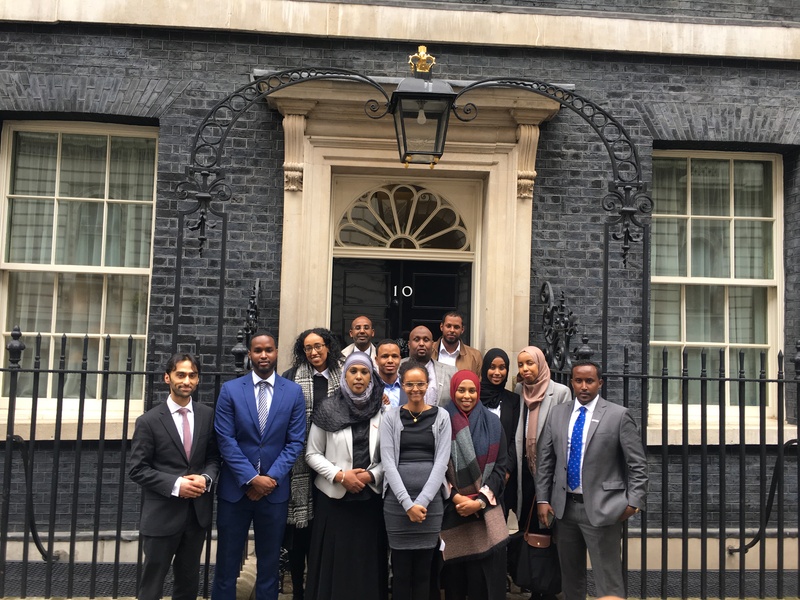 ATM Fellows Visit 10 Downing Street! Last Friday, ATM Fellows made their mark on No.10 Downing Street in an exciting meeting with the Prime Minister’s advisers. The group were joined by representatives from SOAS University of London and Dahabshiil who have been the principal sponsor of the ATM programme since its inception. The group entered the home of British politics through the famous black door where they were guided up the spiralling staircase – past the walls lined with portraits of 27 former prime ministers. The Fellow’s met the Prime Ministers special advisers on Equalities and Integration Policy, Communities and Social Justice and Faith. The Fellow’s presented a number of recommendations around current government policy in relation to the Somali community. On positive Somali stories, fellow Intisar Yusuf spoke of the contributions Somalis have made to British Somali through arts. Intisar shared the stories of Warsan Shire and Momtaza Mehri – both young Somali women and both selected as Young Poet Laureates for London. On the Integration Strategy, Abdiweli Elmi shared the need for the government to better assess ways of working with the Somali community especially around Hate Crimes. On the Race Disparity Audit, fellows Hamdi Mohamed and Hodan Madar shared startling stories highlighting the disparity between exclusion rates for Somali students in comparison to their peers. On the Lammy Review, Awale Elmi shared perspectives from his community programme Rise Projects based in Haringey – where he shared stories to highlight the disparity in engagement with the Somali community across London boroughs. The main recommendation for the meeting was for government support in an upcoming White Paper to include a Somali ethnic ‘tick-box’ in the 2021 census to capture data on Somalis in the U.K, which will enable the government to better understand the needs and challenges faced by the Somali community. After the meeting, the fellows enjoyed a tour of No.10 Downing Street’s fine rooms. Most memorable was the Cabinet Room where some of the most important decisions in British politics are being made. The entire experience was captivating for the fellows and has inspired them to pursue future meaningful engagement in public life to authentically represent the communities in which they serve.